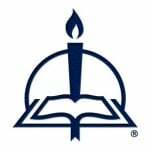 The Old Testament and intertestamental teachings about the Law are important background for understanding comments on the Law and its purpose in the writings of Jewish and Christian teachers of the first century A.D. The Lord Jesus raised the matter when He taught His disciples about the Law on the night when He was betrayed. In addition, the Gospel writers drew on the prophecy of Ps 41:9 about the circumstances of Jesus’ betrayal by Judas, tapping into the wisdom themes of friendship. These themes will be our focus in this chapter. The Law, love, election, and friendship are bound up with one another in Jesus’ teaching that night when His trial would begin. His friends would flee from Him and He would face the cross the next day forsaken by His Father. Yet even on this darkest path of human suffering and experience, Jesus was anticipating the role of the law of love for His wayward disciples whom He would befriend again after the resurrection. As part of Jesus’ teaching about friendship and the new commandment, He described a change in status for His disciples. Formerly, He could call them servants. But now that Jesus had taught them, He gave them the status of friends, which included a new relationship with Jesus and His Father. We shall see that other first century teachers also described a change in status with respect to God and His Law. A contemporary of Jesus and St. Paul was Philo Judaeus of Alexandria (c. 20 BC–AD 50). In the treatise On Mating with the Preliminary Studies, Philo explained that God uses the Law’s afflictions to correct people. He included an expression for the Law that has similarity to an expression used later by the apostle Paul, referring to the work or power of the law. The passage bears the marks of the Jewish wisdom literature tradition described in chapter two, including a quotation of Pr 3:11 about the Lord’s instruction or discipline. In the passage, Philo’s allegory on Gn 16:1–6 included a contrast between Hagar and Sarah, who embody different levels of education and virtue. He described how Sarah would use the Law to correct and instruct Hagar for her good; Philo insisted on reading the account in Gn 16 as an allegory about the effect of the Law upon someone’s mind. There is yet another interesting expression to note in the passage from Philo above. He wrote that the mind “exercises itself in the preliminary studies.” A similar idea appears in Paul’s first letter to Timothy, “Train yourself for godliness” (1 Tm 4:7). We shall see that other authors used the idea of exercise to describe the work of the Law. Note that in Philo and in Paul there is also a change in status described in connection with the Law. Philo describes minds that are at first chastened but later become victorious. Paul describes a slave-like existence under the Law as guardian, followed by a status of sonship and freedom. These descriptions of changes in status form an interesting parallel with the teachings of Jesus above. However, one should not conclude from these parallels that there is a direct dependence for this point among the teachers. Instead, it seems likely that scribes during the intertestamental period were considering how God’s Law “worked” in people’s lives and what the purpose of the Law should be. Jesus, Philo, and Paul likely built on this theme, which had important application for believers generally. The moral failures of Israel and Judah that caused the exiles under the Assyrians and Babylonians, as well as the suffering under the Seleucids, likely prompted this focus on the Law and its work, as appears also in wisdom psalms such as Ps 1 and Ps 119. In one of Paul’s earliest letters he raised the question, “Why then the law?” (Gal 3:19) and provided answers about the purpose, function, or use of the law (3:19–29). Like Philo, Paul also used the expression “the work of the law” as illustrated in Rm 2:12–16. For all who have sinned without the law will also perish without the law, and all who have sinned under the law will be judged by the law. For it is not the hearers of the law who are righteous before God, but the doers of the law who will be justified. For when Gentiles, who do not have the law, by nature do what the law requires, they are a law to themselves, even though they do not have the law. They show that the work of the law is written on their hearts, while their conscience also bears witness, and their conflicting thoughts accuse or even excuse them on that day when according to my gospel, God judges the secrets of men by Christ Jesus. The expression “work of the law” was an important step toward considering the use of the law. The passage is also one of the few places in the New Testament where the terms “Law” and “Gospel” appear together. For these reasons, Rm 2:15 would become a key passage in the early history of the doctrine of the Law, as will be seen in the next chapter. The aim of our charge is love that issues from a pure heart and a good conscience and a sincere faith. Certain persons, by swerving from these, have wandered away into vain discussion, desiring to be teachers of the law, without understanding either what they are saying or the things about which they make confident assertions. Now we know that the law is good, if one uses it lawfully, understanding this, that the law is not laid down for the just but for the lawless and disobedient, for the ungodly and sinners, for the unholy and profane, for those who strike their fathers and mothers, for murderers, the sexually immoral, men who practice homosexuality, enslavers, liars, perjurers, and whatever else is contrary to sound doctrine, in accordance with the gospel of the glory of the blessed God with which I have been entrusted. 1 Tm 1:8 is a vital source of western Christian teaching about use of the Law, as will be demonstrated in the following chapters. Like Rm 2:12–16, 1 Tm 1:3–11 is also one of the few places in the New Testament where the terms “Law” and “Gospel” appear together. As a consequence, these texts were bound to have an important role in the theological discussions about the relationship between the doctrines of Law and Gospel. Text amended and footnotes omitted. 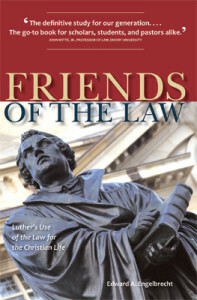 From Friends of the Law: Luther’s Use of the Law for the Christian Life, pages 21–25 © 2011 Concordia Publishing House. All rights reserved. To order Friends of the Law, please contact CPH at 800-325-3040 or visit www.cph.org.